[page 1 top] They going to do there? Have the children put the Croquet set out yet? Mamie says Zella can walk I want to see her so very much. We have such a pretty Park here it is just across the road from our school room, we go there at recess some times we hunt for four leaf clover and sit on the seats and tlk. They have iron chairs and settees and four large bases with flowers in. On the north side of it is the City scales with a little house attached to them and on top of this the band plays in the evening. Have you got many flowers? What do you do to keep your self busy? I expect you have enough to do. How is H. G. M. getting along? I mean the beautiful young lady across the street. Ma said Mr. Behner and Martin’s were not on good terms what is the trouble? How is Annie Quin getting along does she go to our house much now? Did you read her book and is it nice? She said she was going to send me one but did not. Have you heard from Ed lately? 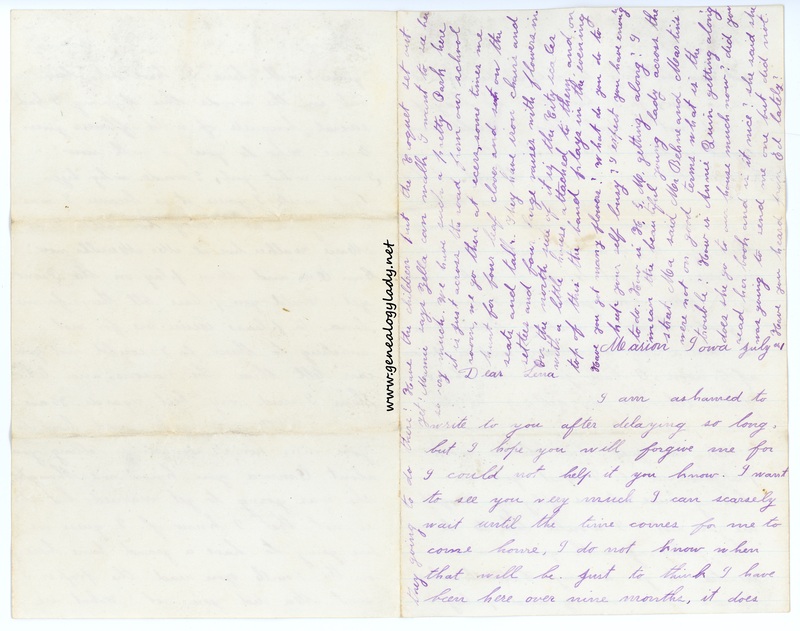 This entry was posted in Fayette Friday, Genealogy and tagged 1870s, Connersville, Fannie L. (Gilchrist) Merrell, Frances (Luther) Gilchrist, genealogy, Indiana, Iowa, Lena (Scofield) Hackleman, Marion, Zella (Gilchrist) Doran on August 25, 2017 by Deborah Sweeney. 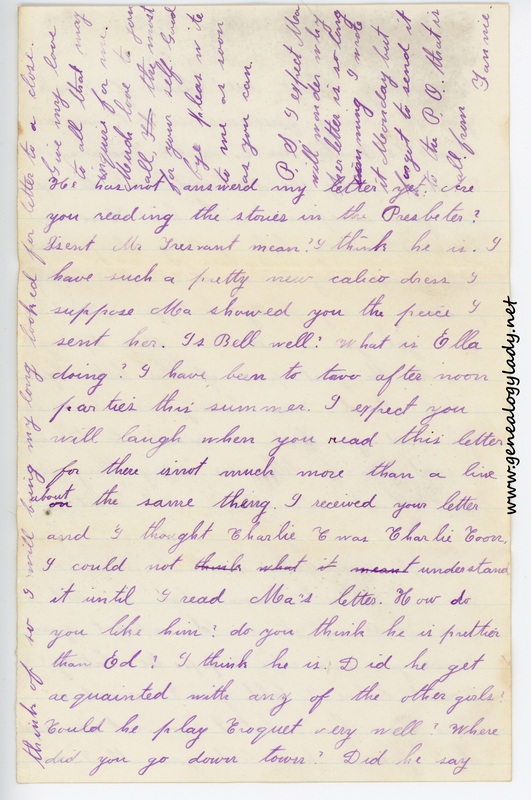 A second letter from Fannie Gilchrist to Lena Scofield. It is not clear whether this is the first letter or the second, since last week’s letter did not include the year. While this letter describes part of Fannie’s journey to Iowa, it could have been written months afterwards. Fannie becomes a great contemporary witness to the fire that destroyed Chicago in October 1871, as she mentions traveling through a burnt section of the city. 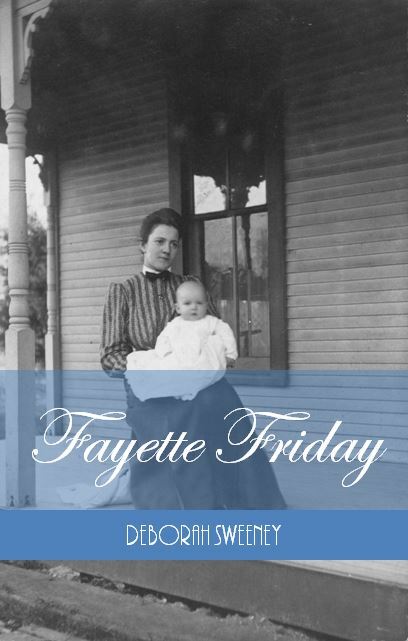 This entry was posted in Fayette Friday, Genealogy and tagged 1870s, Connersville, correspondence, Fannie L. (Gilchrist) Merrell, Fayette County, genealogy, Indiana, Iowa, Lena (Scofield) Hackleman, letters on August 11, 2017 by Deborah Sweeney. During the early 1870s, most likely 1872 or 1873, Fannie Gilchrist moved from Connersville, Indiana, to Marion County, Iowa, with her family. Fannie’s sister Zella has conflicting birth locations in 1872, either in Iowa or Fayette County. While Fannie’s brother Clifford, born in 1873, always claimed Indiana as his birthplace. Regardless, Fannie’s family seems to have moved back and forth between Fayette County and Iowa. Fannie married in Fayette County, in 1877, and remained there until the deaths of her husband and son in the early 1910s. 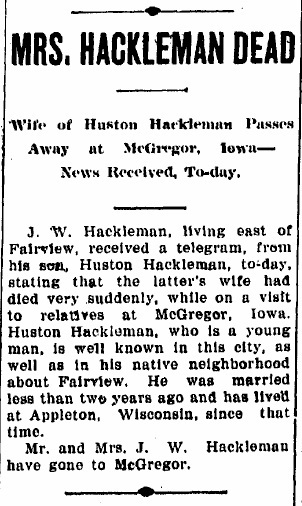 Fannie’s parents moved to Iowa before 1900 and were buried across the border in Kansas. 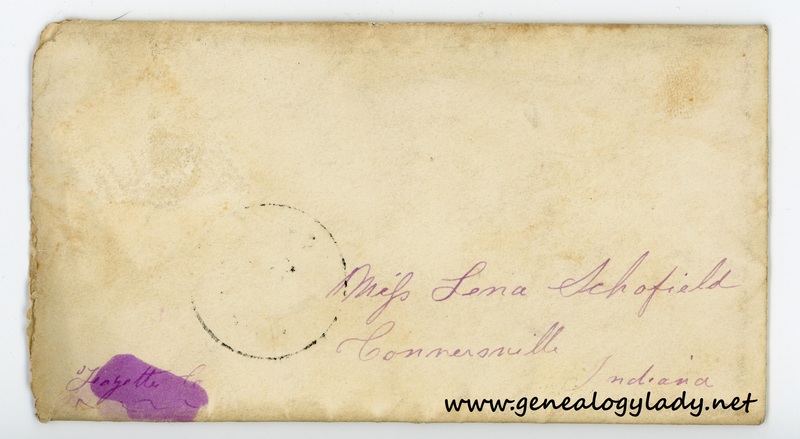 Lena and Fannie most likely attended school together in Connersville as young girls and teenagers. 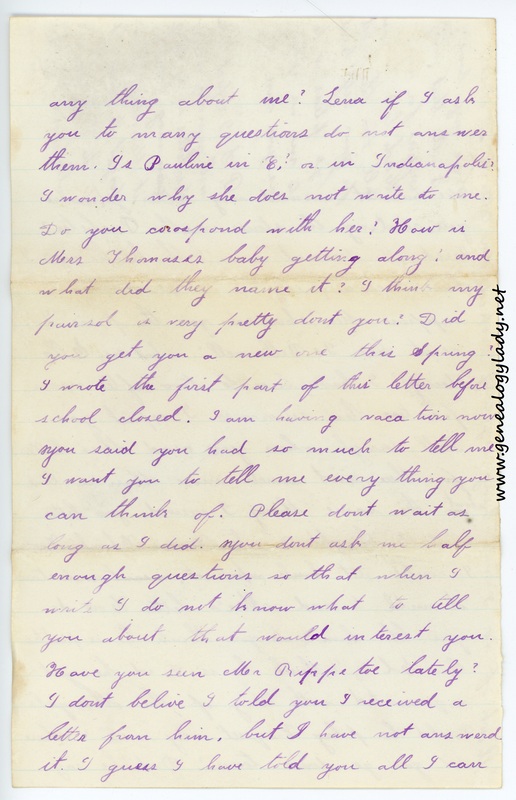 Born in November 1856, Fannie was about 16 when this letter was written. I thought I would send you a little note with Ma’s letter to let you know that I have not forgotten the nice times we use to have. I hope you will excuse me for not answering your letter, I intend to as soon as possible. O! I want to see you so very much. I am so sleepy I will have to close this long note. P.S. Please excuse paper. From Fannie to dear Lena. 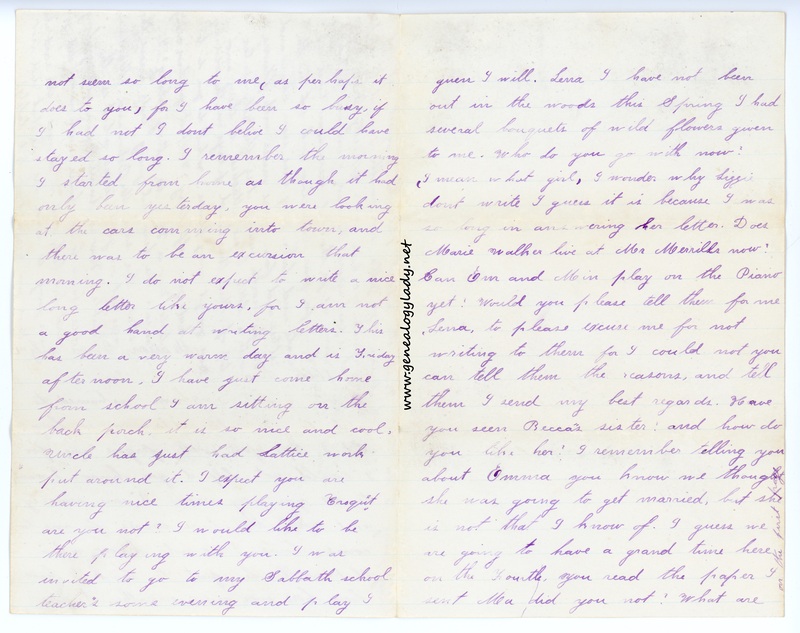 This entry was posted in Fayette Friday, Genealogy and tagged 1870s, Connersville, correspondence, Fannie L. (Gilchrist) Merrell, Fayette County, Indiana, Iowa, Lena (Scofield) Hackleman, letters on August 4, 2017 by Deborah Sweeney.